Not far from the farm in Maryland where I grew up was this stone quarry. They called it Sylvan Dell. When I was little, my sisters and I would ride our horses by there all the time. Daddy told us to be very careful and stay on the trail, and that was because the ground, not 20 feet from the path, dropped into this sheer cliff that plunged to the bottom of the quarry. This quarry was a busy place. There were steam shovels and trucks moving rocks because the flagstone was for the new housing developments going up near the farm. The quarry was noisy—a lot of hammering, a lot of dust, a lot of hard work and sweat. But that quarry produced flagstone and some pretty, beautiful, Maryland quartz crystal. We would ride our horses along the trail and anywhere, on either side of the bridle path, there would be these little bits of sparkling quartz scattered everywhere, all shiny and glittery and dazzling. When I was a kid, I thought we were walking on diamonds—like somebody opened a treasure chest and scattered precious jewels everywhere. Malachi 3:16 describes how the Lord has a book in which all the names of those who love Him are written down. And He calls these people His jewels. So how do we become jewels that glitter, and I mean really shine? I know if I want a rock, let’s say my diamond wedding ring, to dazzle, I’ll ask my “get-up” girl in the morning to take my toothbrush and scrub my ring. That’s me. What can I say? I long, I desire, I want to be a jewel that does not cringe if God chooses to give my soul a hard scrubbing every now and then. Now, I’m not glorifying the suffering it takes to polish my faith. But I am glorifying the God whose image is reflected on the surface of any smile—my smile—that might be hard-fought for through pain or problems. If you want God’s glory to be your shine, it will be on His terms. His glory will be the glow of His godliness in your life; His patience and perseverance. The conviction is that the Father is worth trusting and obeying, no matter how painful the trial. His terms call for you to be refined like silver and for me to be tested like gold. That is something over 40 years in a wheelchair has shown me. But no, my soul can stand a good scrubbing, because I have not arrived. This week, when I had to call Nancy and tell her that I could not be with you [live at the conference], when pain was blind-siding me, it was obvious to me that God thinks my soul can still take a good scouring. And with this pain, I struggle with claustrophobia and fear—claustrophobia, thinking that it’s going to get worse, and fear that it’s not going to go away, and it’s not going to get better. I know you can identify. You’ve got problems that never go away. You pray, you plead until your knees get sore, yet your pinched nerve doesn’t heal, the pregnancy test doesn’t come back positive, the multiple sclerosis doesn’t halt, your teenager keeps sneaking drugs, your parent’s Alzheimer’s doesn’t regress, the marriage doesn’t get better, the job promotion never comes, the engagement ring never arrives. Well, my paralysis never went away. Job was right when he said, “Man was born to trouble.” Jesus was right when He said, “In this world you will have trouble.” Trouble is the textbook that will teach you who you really are. Trouble is what will squeeze the lemon inside of you—you know, that squeezed lemon that keeps revealing the stuff of which you are made, and it’s not very pretty. I’ll confess it. When I’m in pain, I implode; I collapse in defeat. And if I let it simmer, not going to God’s Word, not turning to Him in prayer, I become selfish; I become impatient; I become irritated, mean-spirited. I get this—there’s no better word for it—peevish, really sour attitude. Maybe for you, when trouble hits you, you’ve got a smile for everybody at the supermarket or J. C. Penny’s, or Macy’s, but that smile stays right there at the cashier’s desk. And when you head home, you leave it back where you were shopping. Or maybe for you, it’s a lazy approach to God’s Word. I know that happens to me. Unbelief in prayer, snapping at your kids, your husband, you sit there stewing in church, and you think about the workweek ahead. You’re tired, indifferent, stale, sour, itching to get things your own way—oh my goodness, get out the toothbrush, because God knows that’s the dirt, the scum, and the impurities the Lord wants to scour away. You see, here it is, plain and simple: the core of God’s plan is to rescue us from our own sin. Yes, He did that back on the Cross. But with this whole sanctification thing, He’s got a long way to go with us, and the Father is Heaven-bent on conforming us—conforming you—to the image of Jesus Christ. And first and foremost, that means getting rid of sin. Yes, to be made like Jesus is to become kind and gentle and thoughtful and compassionate, but first, if you really want to be like Christ, then you’ve got to learn to hate sin, because to be like Jesus is to be made sin-less. God is concerned about your poverty or my pain. He’s concerned about your broken heart or my broken neck, but those things are not His ultimate focus. He cares about them, but those things are merely symptoms of the root and real problem. God cares most, not about making you and me comfortable, but about teaching us to hate our transgression and to grow up spiritually to love Him. That’s the purpose behind the toothbrush. That’s the purpose behind the refining and the chipping and the polishing. 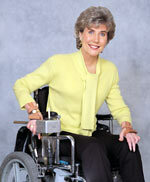 Joni Eareckson Tada is the founder and CEO of Joni and Friends (www.joniandfriends.org), an organization that promotes Christian ministry in the disability community. This excerpt is taken from her longer message at the True Woman ‘08 Conference. Visit www.truewoman.com to read or watch it in its entirety.